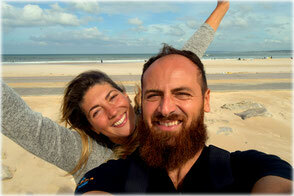 We are Flavia and Michele, Italians who moved to Portugal several years ago. After a couple of months travelling around Portugal, we decided to settle here in the Algarve's West coast, as this was the place where we felt so much at home. You could say this place chose us! So we decided to start our own adventure here, creating our cosy bed and breakfast just a few kilometres from the Atlantic Ocean. Moving to Portugal was a big challenge for us. We decided to totally change our lifestyle and, after a few years, we can proudly say that we are happy we did just that. Better quality of life, no stress, nature and the ocean – compared to city life, traffic jams and office jobs, it seems like an easy win! But such a big change actually takes lots of energy – focusing on what you want from life and stuff like that. In the end we managed to do that and it was the best thing we ever did! Michele is a guitar player, in love with music and always searching for good tunes for our "Breakfast soundtrack"! He is also an amateur photographer and has found this to be the perfect playground to practice his great passion. He's a biker as well and the twisty roads and hills of the Algarve are certainly the best place for that. Flavia loves art in general and she likes creating decorations using natural resources that the land has to offer. She loves painting and cooking, as well as staying up-to-date about all kinds of events taking place locally, and throughout the Algarve. Now you know to who ask for! All of these passions helped us make our dream come true. Daily, we share our house with guests from all over the world, and we put our hearts into making them feel at home as much as we can. We both love healthy, slow food and cooking, so you'll get the best tips about all the best restaurants in the area. We love the west coast and we are happy to infuse our guests with recommendations about the best beaches, lookout points, surf spots, restaurants and great hikes in the area. Well, now it's your turn! Come and visit us, we'll be glad to meet and welcome you into our lovely Onda Vicentina bed and breakfast!